The RYA Professional Practices & Responsibilities (PPR) course went live on 2 April 2012. Now it is a pre-requisite for anyone applying for or renewing their commercial endorsement through the RYA. This course is NOW AVAILABLE ON iPad. You can complete the course and assessment at your own pace and in the comfort of your home or office. PPR is for anyone using a RYA qualification or Certificate of Competence to gain a commercial endorsement in order to work professionally as skipper or crew and is a compulsory online course for new and revalidating RYA Commercial Endorsement holders. Whatever vessel you work on it will help you understand & execute your duty of care and give you the principles, guidance and techniques to make the right choices and decisions. PPR is for anyone using a RYA qualification or Certificate of Competence to gain a commercial endorsement in order to work professionally as skipper or crew. Fully inclusive (no hidden extras!) Easy secure payment book online with PayPal. 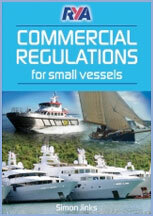 Ensuring your vessel is suitable and legal for the work you are doing. Creating and implementing risk control and operating procedures. Compulsory carriage and maintenance of safety equipment. Your obligations to crew and passengers. The safe management of commercial vessels. An online course to assist in working professionally with your RYA Certificate of Competence. Whatever vessel you work on it will help you understand & execute your duty of care & give you the principles, guidance & techniques to make the right choices & decisions. More importantly, it will teach you where to find the information you need to ensure you are operating within the law. This is a purely online course, there are no books or course packs. Once you have registered & paid with RYA Interactive you will be enrolled onto the course. You can commence the course immediately, all you need is a computer & internet access. The course consists of 4 modules, the RYA estimate users will take around 6 to 8 hours to work through the four course modules. Following these, there is a mock assessment so you can check you are ready before moving on to the final online assessment. The graded end of course assessment is split into two sections, Scenario based & General Knowledge. These are timed assessments totalling 2 ½ hours. On successful completion of the final assessments you can print off your own certificate. Anyone who ventures afloat while operating commercially needs to be aware of their responsibilities to the vessel, those around them & the environment. This book covers these responsibilities & has been split into the following three sections: The Legal Framework Regulation of Vessels The Skipper & Crew Filled with essential information, it will help the reader understand & execute their duty of care, & gives the principles, guidance & techniques to make the right choices & decisions for all craft operating commercially from small RIBs up to 200gt vessels. The book is designed to accompany the new RYA’s Professional Practices & Responsibilities course and is written by Simon Jinks, a former RYA Chief Cruising Instructor & an acknowledged authority in the field of small vessel training & safety management. click on BOOK NOW below, you will automatically be taken to PayPal for payment after submitting our booking form, (you can pay by credit card and don’t need a PayPal account). If you wish to pay by an alternative method please contact us.